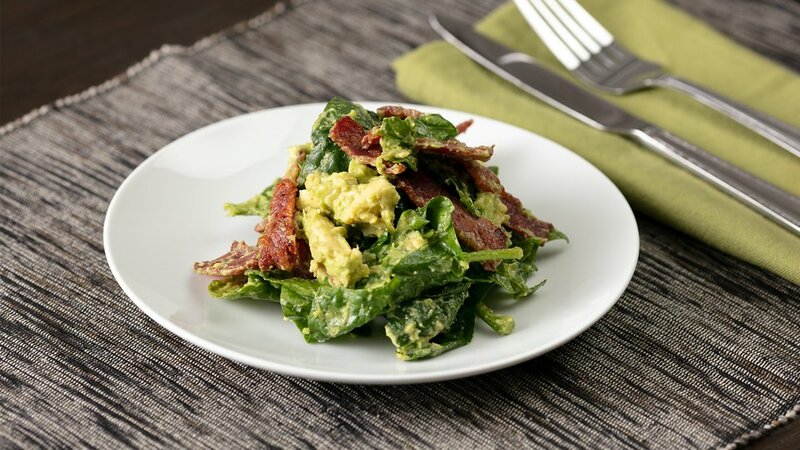 Substituting turkey bacon for its pork cousin helps lower the saturated fat and overall calories of this quick and easy salad. Other than salt and pepper for seasoning, this quick, fresh lunch has only four ingredients, making it an easy throw-together meal on busy days. In a skillet, cook the turkey bacon until crispy. Remove the avocado from its skin and cut it into 1/4-inch slices. Mix the lemon juice, spinach, and avocado with your hands until the avocado is mashed in with the spinach. Toss in the bacon and serve.